Happily vegan and gluten-free + so easy to whip up. The batter’s made right in the blender with pulverized oats for the flour, a ripe banana, and almond “buttermilk.” The end product? Hearty, golden, lighter than you’d think, and tender too. And SO good with blueberries! I just love creating recipes. But I have to admit, sometimes it makes my insecure side really nervous to put them out into the world. I mean, I’m just one chick in one kitchen. What if my recipes go completely wrong for everyone else? 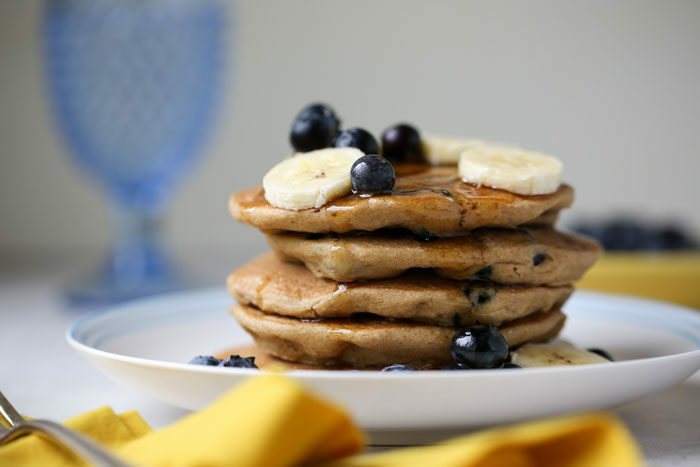 My banana oat blender pancakes were one such recipe that I worked super hard on getting just right, but publishing it was a little nerve-wracking. 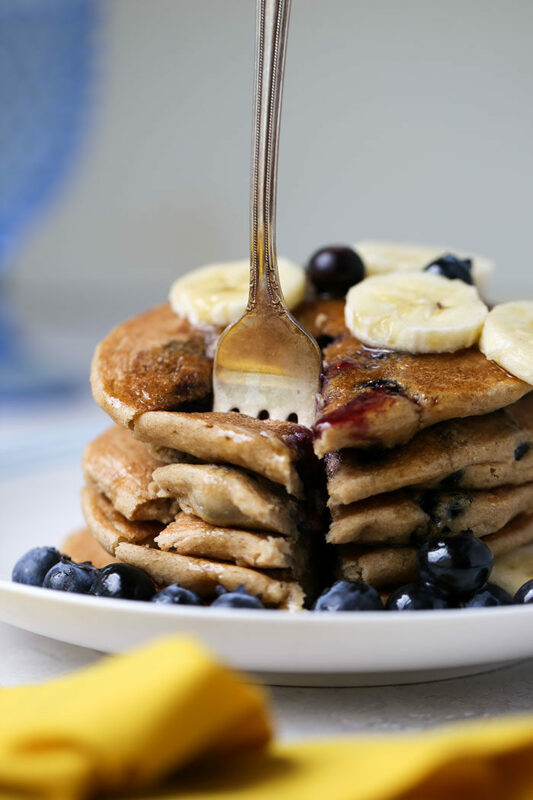 We’ve probably all had a bad batch of vegan and/or gluten-free pancakes in our lives, and what if these just turned out amazing for me only?! Well, thankfully, that recipe has garnered lots of great reviews and five-star ratings. Yay! 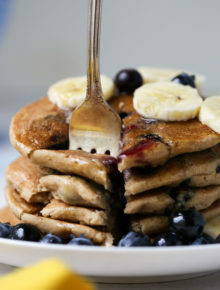 And so now, I share my favorite gluten-free vegan pancake recipe again – this time, with blueberries. Everything is better with blueberries, am I right?! 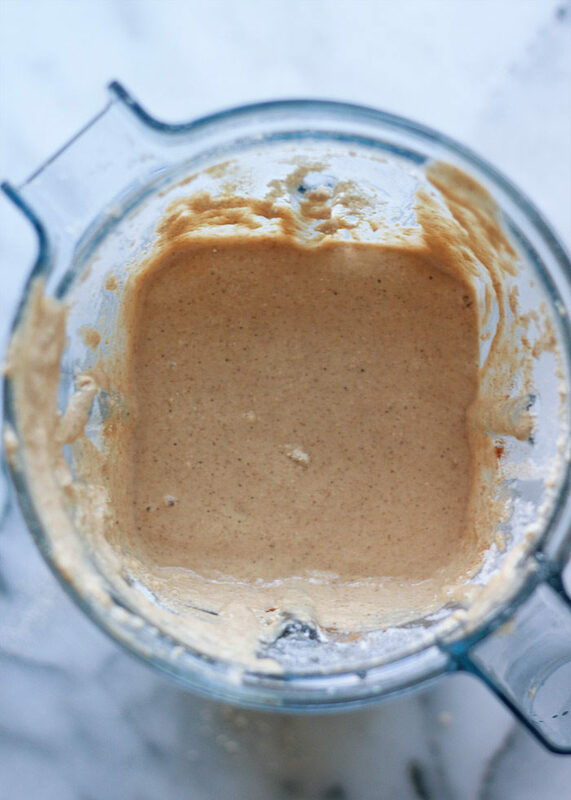 The method is the same – start up your buttermilk (in this case, almond milk + vinegar), then pulverize some rolled oats in your blender (that’s your flour). Then add a nice ripe banana, baking soda, baking powder, some pure maple syrup for sweetening, vanilla, cinnamon, salt … yep, almost there. Add the milk and blend. Voila! Pancake batter. SO EASY, right? Then just fold in a generous cup of blueberries, and get to griddling. 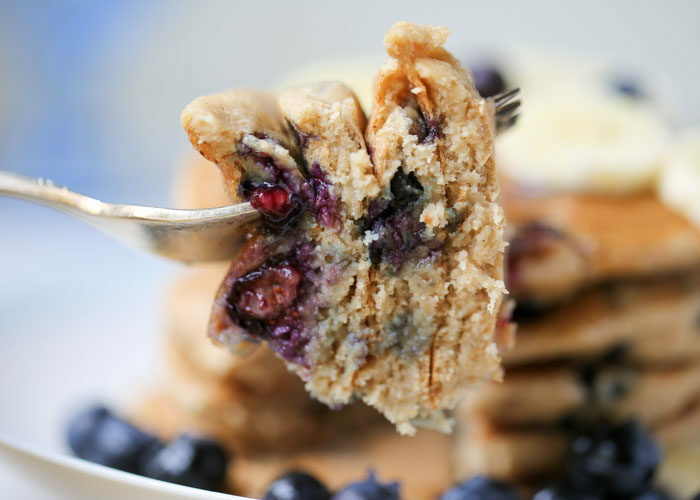 Banana oat blender pancakes with blueberries are fantastic, my friends. Tender, full of flavor, bursts of tart berry bites … like, my stomach is seriously grumbling, writing about these. BRB, making more. Hope you make ’em (and love ’em) too. Add the vinegar to a 1-cup or larger liquid measuring cup. Add almond milk. Stir and set aside for about 5 minutes. Meanwhile, grind the oats into a flour by adding them to the pitcher of a blender and pulsing until fine. Add the remaining ingredients EXCEPT BLUEBERRIES to the blender. Puree, scraping down the sides once or twice if necessary, until completely combined. Add the blueberries to the batter and stir gently to incorporate the blueberries into the batter. Heat a griddle or non-stick frying pan to about 325 degrees Fahrenheit (medium heat). It’s hot enough when you sprinkle a couple drops of water onto the surface and the drops dance around. If the griddle/pan is nonstick, you shouldn’t need any oil/vegan butter. Otherwise, you may want to melt a little oil into the pan before cooking the pancakes. Pour approx. 1/3 cup per pancake onto the griddle or pan (the pancakes will be 4-5 inches in diameter). Cook for 1-2 minutes until the pancakes look dry around the edges and a little bubbly. Flip and cook on the other side until golden brown and cooked in the middle. If the pancakes brown before the middle is cooked through, try lowering your heat a bit. No one would ever know these were vegan! I have company coming and one of the visitors is gluten free so I’m planning to make these at that time. Does it matter if the almond milk is sweetened? We don’t typically purchase unsweetened. These are fantastic. Can they be frozen then reheated? Absolutely! I get them out and leave them on the counter for about 20 minutes to help thaw the middle, then pop them in the toaster! These are fantastic! I’ve made them several times and they’re always delish. My only problem has been sticking in a stainless steel pan. I have great success with my non stick Griddler. What would you recommend to grease the pan if my only option is a stainless steel pan? 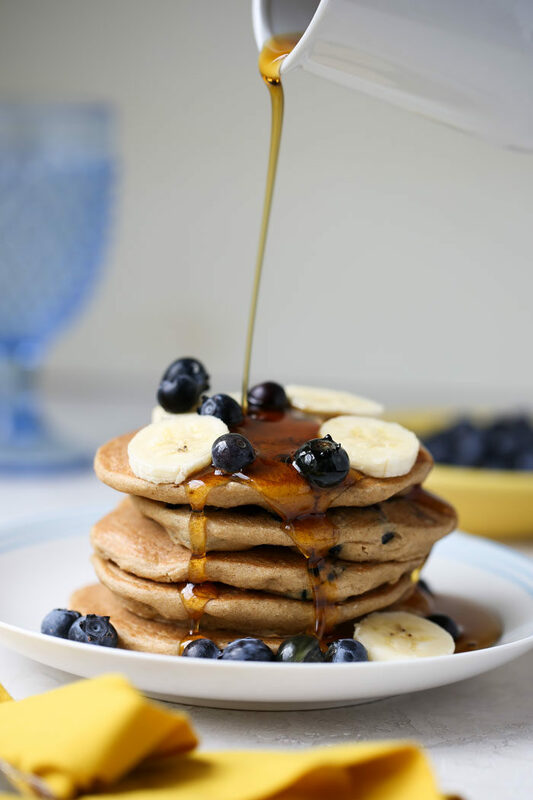 These pancakes are my absolute favourite. For the past few months, I’ve been trying a different pancake recipe every weekend. Trying to find the tastiest (I even tried Tasty.com). So far, this is the best recipe. In fact, I think I’m just going to stop here. These are fantastic. I’m so glad you like the recipe! 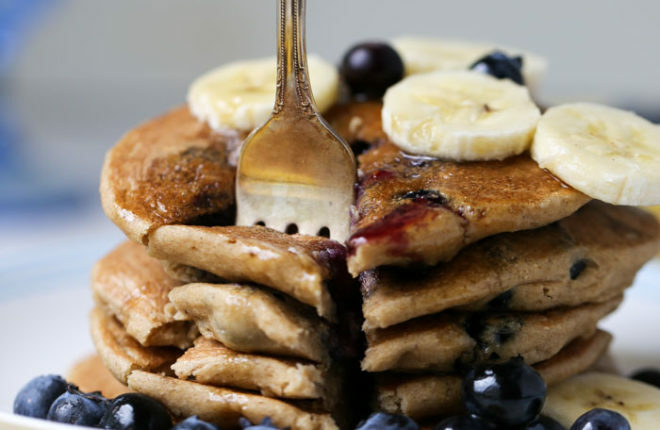 I love the idea of trying a different pancake recipe every week. But I also love the idea of you stopping with this one! 😉 Thanks!